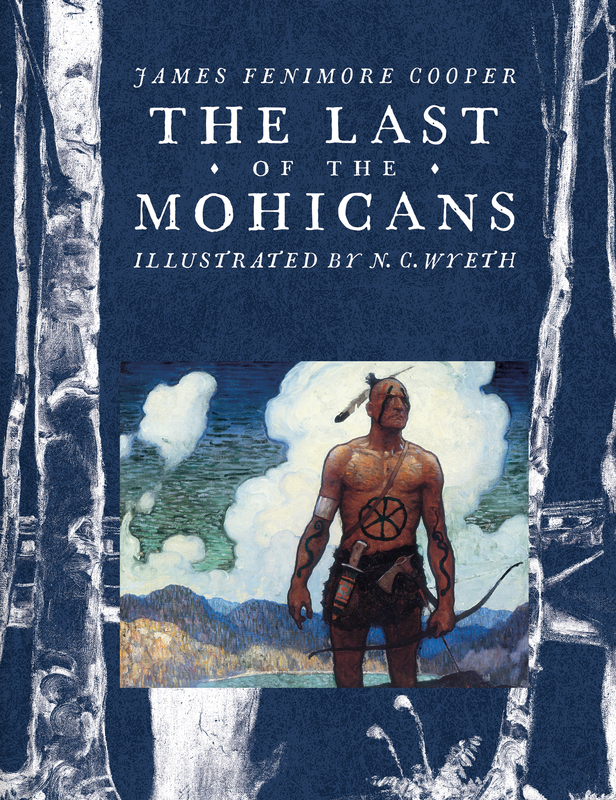 A gorgeously crafted edition of a great American classic—James Fenimore Cooper’s epic tale of frontier life during the French and Indian War, complete with lush tip-in illustrations. Chingachgook and Uncas are the last living members of the great Mohican tribe. Hawkeye, a colonial scout, is their companion and loyal friend. In the midst of the French and Indian War, these three will risk everything to lead the two daughters of a British colonel to safety through the battle-torn northern wilderness. When the girls are captured by the vicious Huron tribe, Chingachgook, Uncas, and Hawkeye determine to do whatever they can to save them—no matter the cost. This keepsake edition of James Fenimore Cooper’s acclaimed novel showcases magnificent illustrations by N.C. Wyeth. IT WAS A FEATURE peculiar to the colonial wars of North America, that the toils and dangers of the wilderness were to be encountered before the adverse hosts could meet. A wide and apparently an impervious boundary of forests severed the possessions of the hostile provinces of France and England. The hardy colonist, and the trained European who fought at his side, frequently expended months in struggling against the rapids of the streams, or in effecting the rugged passes of the mountains, in quest of an opportunity to exhibit their courage in a more martial conflict. But, emulating the patience and self-denial of the practised native warriors, they learned to overcome every difficulty; and it would seem that, in time, there was no recess of the woods so dark, nor any secret place so lovely, that it might claim exemption from the inroads of those who had pledged their blood to satiate their vengeance, or to uphold the cold and selfish policy of the distant monarchs of Europe. Perhaps no district throughout the wide extent of the intermediate frontiers can furnish a livelier picture of the cruelty and fierceness of the savage warfare of those periods than the country which lies between the head waters of the Hudson and the adjacent lakes. Winding its way among countless islands, and imbedded in mountains, the “holy lake” extended a dozen leagues still farther to the south. With the high plain that there interposed itself to the further passage of the water, commenced a portage of as many miles, which conducted the adventurer to the banks of the Hudson, at a point where, with the usual obstructions of the rapids, or rifts, as they were then termed in the language of the country, the river became navigable to the tide. While, in the pursuit of their daring plans of annoyance, the restless enterprise of the French even attempted the distant and difficult gorges of the Allegheny, it may easily be imagined that their proverbial acuteness would not overlook the natural advantages of the district we have just described. It became, emphatically, the bloody arena, in which most of the battles for the mastery of the colonies were contested. Forts were erected at the different points that commanded the facilities of the route, and were taken and retaken, razed and rebuilt, as victory alighted on the hostile banners. While the husbandman2 shrank back from the dangerous passes, within the safer boundaries of the more ancient settlements, armies larger than those that had often disposed of the sceptres of the mother countries, were seen to bury themselves in these forests, whence they rarely returned but in skeleton bands, that were haggard with care, or dejected by defeat. Though the arts of peace were unknown to this fatal region, its forests were alive with men; its shades and glens rang with the sounds of martial music, and the echoes of its mountains threw back the laugh, or repeated the wanton cry, of many a gallant and reckless youth, as he hurried by them, in the noontide of his spirits, to slumber in a long night of forgetfulness. It was in this scene of strife and bloodshed that the incidents we shall attempt to relate occurred, during the third year of the war which England and France last waged for the possession of a country that neither was destined to retain. The imbecility of her military leaders abroad, and the fatal want of energy in her councils at home, had lowered the character of Great Britain from the proud elevation on which it had been placed by the talents and enterprise of her former warriors and statesmen. No longer dreaded by her enemies, her servants were fast losing the confidence of self-respect. In this mortifying abasement, the colonists, though innocent of her imbecility, and too humble to be the agents of her blunders, were but the natural participators. They had recently seen a chosen army from that country, which, reverencing as a mother, they had blindly believed invincible—an army led by a chief who had been selected from a crowd of trained warriors, for his rare military endowments, disgracefully routed by a handful of French and Indians, and only saved from annihilation by the coolness and spirit of a Virginian boy, whose riper fame has since diffused itself, with the steady influence of moral truth, to the uttermost confines of Christendom. A wide frontier had been laid naked by this unexpected disaster, and more substantial evils were preceded by a thousand fanciful and imaginary dangers. The alarmed colonists believed that the yells of the savages mingled with every fitful gust of wind that issued from the interminable forests of the west. The terrific character of their merciless enemies increased immeasurably the natural horrors of warfare. Numberless recent massacres were still vivid in their recollections; nor was there any ear in the provinces so deaf as not to have drunk in with avidity the narrative of some fearful tale of midnight murder, in which the natives of the forest were the prinicipal and barbarous actors. As the credulous and excited traveller related the hazardous chances of the wilderness, the blood of the timid curdled with terror, and mothers cast anxious glances even at those children which slumbered within the security of the largest towns. In short, the magnifying influence of fear began to set at naught the calculations of reason, and to render those who should have remembered their manhood, the slaves of the basest of passions. Even the most confident and the stoutest hearts began to think the issue of the contest was becoming doubtful; and the abject class was hourly increasing in numbers, who thought they foresaw all the possessions of the English crown in America subdued by their Christian foes, or laid waste by the inroads of their relentless allies. When, therefore, intelligence was received at the fort, which covered the southern termination of the portage between the Hudson and the lakes, that Montcalm3 had been seen moving up the Champlain, with an army “numerous as the leaves on the trees,”4 its truth was admitted with more of the craven reluctance of fear than with the stern joy that a warrior should feel, in finding an enemy within reach of his blow. The news had been brought, towards the decline of a day in midsummer, by an Indian runner, who also bore an urgent request from Munro,5 the commander of a work on the shore of the “holy lake,” for a speedy and powerful reinforcement. It has already been mentioned that the distance between these two posts was less than five leagues.6 The rude path, which originally formed their line of communication, had been widened for the passage of wagons; so that the distance which had been travelled by the son of the forest in two hours, might easily be effected by a detachment of troops, with their necessary baggage, between the rising and setting of a summer sun. The loyal servants of the British crown had given to one of these forest fastnesses the name of William Henry, and to the other that of Fort Edward; calling each after a favorite prince of the reigning family. The veteran Scotchman just named held the first, with a regiment of regulars and a few provincials; a force really by far too small to make head against the formidable power that Montcalm was leading to the foot of his earthen mounds. At the latter, however, lay General Webb, who commanded the armies of the king in the northern provinces, with a body of more than five thousand men. By uniting the several detachments of his command, this officer might have arrayed nearly double that number of combatants against the enterprising Frenchman, who had ventured so far from his reinforcements, with an army but little superior in numbers. But under the influence of their degraded fortunes, both officers and men appeared better disposed to await the approach of their formidable antagonists, within their works, than to resist the progress of their march, by emulating the successful example of the French at Fort du Quesne, and striking a blow on their advance. After the first surprise of the intelligence had a little abated, a rumor was spread through the entrenched camp, which stretched along the margin of the Hudson, forming a chain of outworks to the body of the fort itself, that a chosen detachment of fifteen hundred men was to depart, with the dawn, for William Henry, the post at the northern extremity of the portage. That which at first was only rumor, soon became certainty, as orders passed from the quarters of the commander-in-chief to the several corps he had selected for this service, to prepare for their speedy departure. All doubt as to the intention of Webb now vanished, and an hour or two of hurried footsteps and anxious faces succeeded. The novice in the military art flew from point to point, retarding his own preparations by the excess of his violent and somewhat distempered zeal; while the more practised veteran made his arrangements with a deliberation that scorned every appearance of haste; though his sober lineaments and anxious eye sufficiently betrayed that he had no very strong professional relish for the as yet untried and dreaded warfare of the wilderness. At length the sun set in a flood of glory, behind the distant western hills, and as darkness drew its veil around the secluded spot the sounds of preparation diminished; the last light finally disappeared from the log cabin of some officer; the trees cast their deeper shadows over the mounds and the rippling stream, and a silence soon pervaded the camp, as deep as that which reigned in the vast forest by which it was environed. According to the orders of the preceding night, the heavy sleep of the army was broken by the rolling of the warning drums, whose rattling echoes were heard issuing, on the damp morning air, out of every vista of the woods, just as day began to draw the shaggy outlines of some tall pines of the vicinity, on the opening brightness of a soft and cloudless eastern sky. In an instant the whole camp was in motion; the meanest soldier arousing from his lair to witness the departure of his comrades, and to share in the excitement and incidents of the hour. The simple array of the chosen band was soon completed. While the regular and trained hirelings of the king marched with haughtiness to the right of the line, the less pretending colonists took their humbler position on its left, with a docility that long practice had rendered easy. The scouts departed; strong guards preceded and followed the lumbering vehicles that bore the baggage; and before the gray light of the morning was mellowed by the rays of the sun, the main body of the combatants wheeled into column, and left the encampment with a show of high military bearing, that served to drown the slumbering apprehensions of many a novice, who was now about to make his first essay in arms. While in view of their admiring comrades, the same proud front and ordered array was observed, until the notes of their fifes growing fainter in distance, the forest at length appeared to swallow up the living mass which had slowly entered its bosom. The deepest sounds of the retiring and invisible column had ceased to be borne on the breeze to the listeners, and the latest straggler had already disappeared in pursuit; but there still remained the signs of another departure, before a log cabin of unusual size and accommodations, in front of which those sentinels paced their rounds, who were known to guard the person of the English general. At this spot were gathered some half dozen horses, caparisoned in a manner which showed that two, at least, were destined to bear the persons of females, of a rank that it was not usual to meet so far in the wilds of the country. A third wore the trappings and arms of an officer of the staff; while the rest, from the plainness of the housings, and the travelling mails with which they were encumbered, were evidently fitted for the reception of as many menials, who were, seemingly, already awaiting the pleasure of those they served. At a respectful distance from this unusual show were gathered divers groups of curious idlers; some admiring the blood and bone of the high-mettled military charger, and others gazing at the preparations, with dull wonder of vulgar curiosity. There was one man, however, who, by his countenance and actions, formed a marked exception to those who composed the latter class of spectators, being neither idle, nor seemingly very ignorant. The person of this individual was to the last degree ungainly, without being in any particular manner deformed. He had all the bones and joints of other men, without any of their proportions. Erect, his stature surpassed that of his fellows; seated, he appeared reduced within the ordinary limits of the race. The same contrarity in his members seemed to exist throughout the whole man. His head was large; his shoulders narrow; his arms long and dangling; while his hands were small, if not delicate. His legs and thighs were thin, nearly to emaciation, but of extraordinary length; and his knees would have been considered tremendous, had they not been outdone by the broader foundations on which this false superstructure of the blended human orders was so profanely reared. The ill-assorted and injudicious attire of the individual only served to render his awkwardness more conspicuous. A sky-blue coat, with short and broad skirts and low cape, exposed a long thin neck, and longer and thinner legs, to the worst animadversions of the evil disposed. His nether garment was of yellow nankeen,7 closely fitted to the shape, and tied at his bunches of knees by large knots of white ribbon, a good deal sullied by use. Clouded cotton stockings, and shoes, on one of the latter of which was a plated spur, completed the costume of the lower extremity of this figure, no curve or angle of which was concealed, but, on the other hand, studiously exhibited, through the vanity or simplicity of its owner. From beneath the flap of an enormous pocket of a soiled vest of embossed silk, heavily ornamented with tarnished silver lace, projected an instrument, which, from being seen in such martial company, might have been easily mistaken for some mischievous and unknown implement of war. Small as it was, this uncommon engine had excited the curiosity of most of the Europeans in the camp, though several of the provincials were seen to handle it, not only without fear, but with the utmost familiarity. A large, civil cocked hat, like those worn by clergymen within the last thirty years, surmounted the whole, furnishing dignity to a good-natured and somewhat vacant countenance, that apparently needed such artificial aid, to support the gravity of some high and extraordinary trust. While the common herd stood aloof, in deference to the quarters of Webb, the figure we have described stalked into the centre of the domestics, freely expressing his censures or commendations on the merits of the horses, as by chance they displeased or satisfied his judgment. Receiving no reply to this extraordinary appeal, which in truth, as it was delivered with the vigor of full and sonorous tones, merited some sort of notice, he who had thus sung forth the language of the Holy Book turned to the silent figure to whom he had unwittingly addressed himself, and found a new and more powerful subject of admiration in the object that encountered his gaze. His eyes fell on the still, upright, and rigid form of the “Indian runner,” who had borne to the camp the unwelcome tidings of the preceding evening. Although in a state of perfect repose, and apparently disregarding, with characteristic stoicism, the excitement and bustle around him, there was a sullen fierceness mingled with the quiet of the savage, that was likely to arrest the attention of much more experienced eyes than those which now scanned him, in unconcealed amazement. The native bore both the tomahawk and knife of his tribe; and yet his appearance was not altogether that of a warrior. On the contrary, there was an air of neglect about his person, like that which might have proceeded from great and recent exertion, which he had not yet found leisure to repair. The colors of the war-paint had blended in dark confusion about his fierce countenance, and rendered his swarthy lineaments still more savage and repulsive than if art had attempted an effect which had been thus produced by chance. His eye, alone, which glistened like a fiery star amid lowering clouds, was to be seen in its state of native wildness. For a single instant, his searching and yet wary glance met the wondering look of the other, and then changing its direction, partly in cunning, and partly in disdain, it remained fixed, as if penetrating the distant air. It is impossible to say what unlooked-for remark this short and silent communication, between two such singular men, might have elicited from the white man, had not his active curiosity been again drawn to other objects. A general movement among the domestics, and a low sound of gentle voices, announced the approach of those whose presence alone was wanted to enable the cavalcade to move. The simple admirer of the war-horse instantly fell back to a low, gaunt, switch-tailed mare, that was unconsciously gleaning the faded herbage of the camp nigh by; where, leaning with one elbow on the blanket that concealed an apology for a saddle, he became a spectator of the departure, while a foal was quietly making its morning repast, on the opposite side of the same animal. A young man, in the dress of an officer, conducted to their steeds two females, who, as it was apparent by their dresses, were prepared to encounter the fatigues of a journey in the woods. One, and she was the most juvenile in her appearance, though both were young, permitted glimpses of her dazzling complexion, fair golden hair, and bright blue eyes, to be caught, as she artlessly suffered the morning air to blow aside the green veil which descended low from her beaver. The flush which still lingered above the pines in the western sky was not more bright nor delicate than the bloom on her cheek; nor was the opening day more cheering than the animated smile which she bestowed on the youth, as he assisted her into the saddle. The other, who appeared to share equally in the attentions of the young officer, concealed her charms from the gaze of the soldiery, with a care that seemed better fitted to the experience of four or five additional years. It could be seen, however, that her person, though moulded with the same exquisite proportions, of which none of the graces were lost by the travelling dress she wore, was rather fuller and more mature than that of her companion. No sooner were these females seated, than their attendant sprang lightly into the saddle of the war-horse, when the whole three bowed to Webb, who, in courtesy, awaited their parting on the threshold of his cabin, and turning their horses’ heads, they proceeded at a slow amble, followed by their train, towards the northern entrance of the encampment. As they traversed that short distance, not a voice was heard amongst them; but a slight exclamation proceeded from the younger of the females, as the Indian runner glided by her, unexpectedly, and led the way along the military road in her front. Though this sudden and startling movement of the Indian produced no sound from the other, in the surprise her veil also was allowed to open its folds, and betrayed an indescribable look of pity, admiration, and horror, as her dark eye followed the easy motions of the savage. The tresses of this lady were shining and black, like the plumage of the raven. Her complexion was not brown, but it rather appeared charged with the color of the rich blood, that seemed ready to burst its bounds. And yet there was neither coarseness nor want of shadowing in a countenance that was exquisitely regular and dignified, and surpassingly beautiful. She smiled, as if in pity at her own momentary forgetfulness, discovering by the act a row of teeth that would have shamed the purest ivory; when, replacing the veil, she bowed her face, and rode in silence, like one whose thoughts were abstracted from the scene around her. James Fenimore Cooper (1789–1851) was a prolific and popular nineteenth century American writer who wrote historical fiction of frontier and Native American life. He is best remembered for the Leatherstocking Tales, one of which was The Last of the Mohicans. N.C. Wyeth (1882–1945) began his artistic career as a young adult. Born in Needham, Massachusetts, Wyeth traveled the American West extensively and drew what he saw. His prolific career includes three thousand works and more than one hundred book illustrations, including those for a majority of the Scribner Illustrated Classics series.